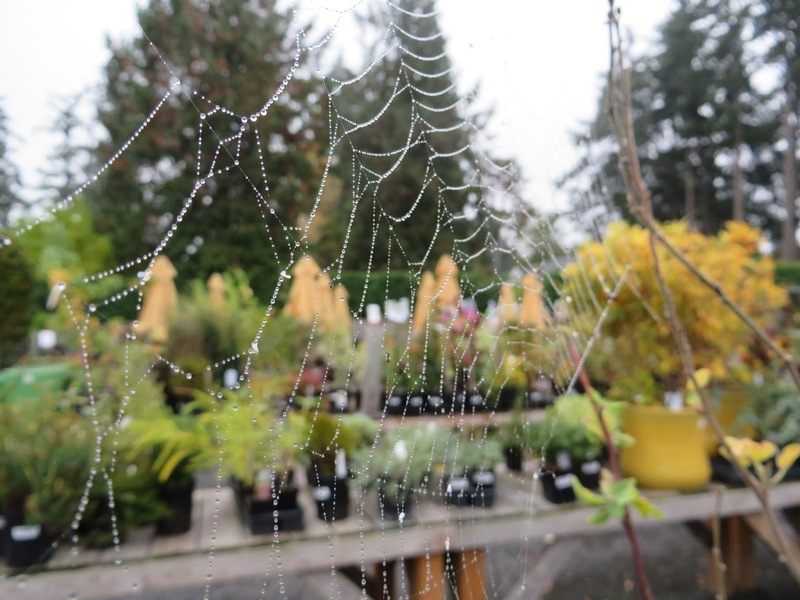 I work at Drake's Nursery in Portland and I would love to show you around. We're having a huge sale right now, but even still there's plenty of wonderful fall color to share. 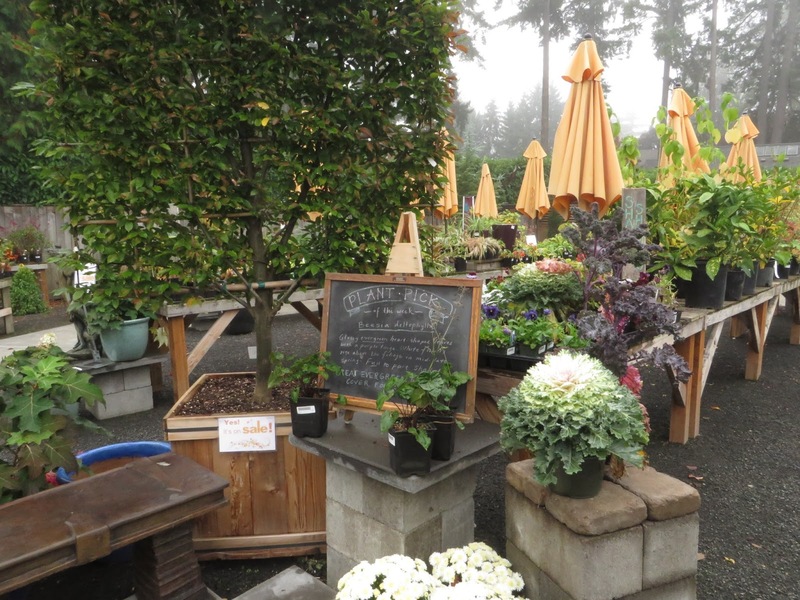 I invite you to sit back, relax and enjoy the tour of what I get to see daily at the nursery. First up, Hamamelis x intermedia 'Diane'. That's its real color. See the buds coming on? It will be one of the earliest bloomers with fragrant red flowers. Viburnum 'Summer Snowflake'. This has been a brilliant red for quite some time, now. 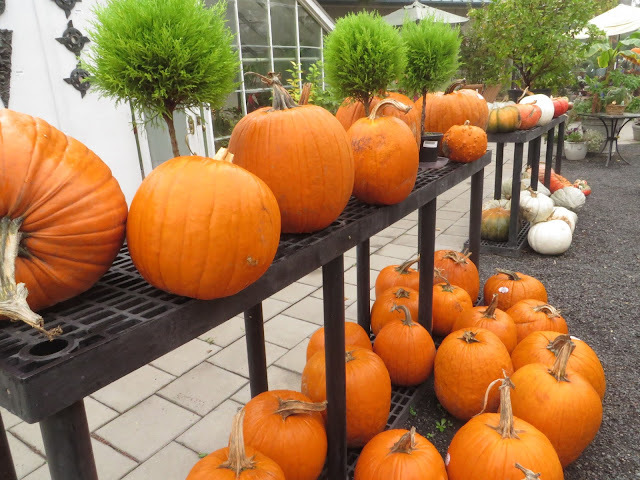 Pumpkins! So many cool ones to choose from - the new "fairytale" ones are my favorite. We also want to move these out, so if you buy one you get two free. Crazy! I'll likely end up taking even more home soon. Then there are these hideous things. Great sale, eh? Yes, just about everything is included. You could buy 11 individual bulbs and it would count. Trees, shrubs, perennials, statuary, pots, bird feeders, bird baths, soil, garden books from Timber Press, garden art, fountains, fertilizer, garden furniture, you name it. Houseplants and fall annuals are excluded. We've been busy getting ready to start up with the holiday season. It's a great joy to match the right plant with the right person. More fall color: Next Generation Pistachio Hydrangea. Sorbaria sorbifolia 'Sem' - false spiraea showing its fall colors. Morning fog at the nursery and our Plant Pick of the Week: Beesia - an evergreen groundcover for shade. It's a great plant. Yes, it's on sale. William bought a bunch of bottles in a rainbow of colors. 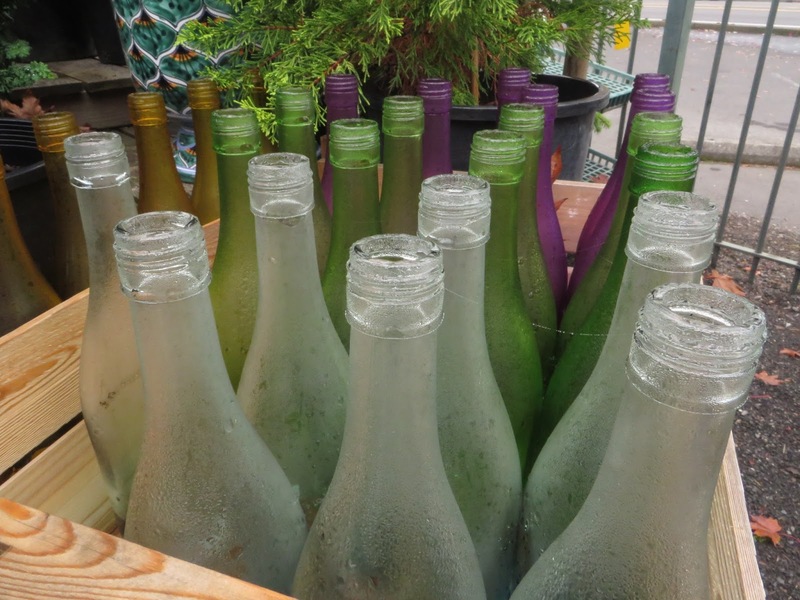 You can use them for your bottle tree or in the kitchen as soap dispensers or oil and vinegar containers. Heucheras looking cheerful in the fog. Oh, how I'd love to have this arch for the new garden. Our stock tank fountain is always a hit, especially with the little birdies of the neighborhood. Sedum table, how I love you so. I recently potted up this container combination. Can you believe it, too, can be 40% off? I think I'm insulted. Well, not really. I hope someone buys it, though! Good ol' faithful Autumn Joy. Doesn't everyone need at least one of these? Carex testaceae or orange sedge. Fall colors of Hypericum x moserianum 'Tricolor'. I do love the coloration on these, even if some Hypericums are considered invasive in certain areas. This container just gets better and better every month. Aster 'Light Blue Double'. And dewdrops. Hardy orchid Bletilla yokohama 'Kate' still blooming away. Euphorbia ascot 'Rainbow'. Not my favorite plant, Euphorbia, but the colors on this are undeniably stunning. Geranium 'Rozanne' doing her thang. Garden art from Atlilier d'Arte, a local artist. Aster 'Prince' - that was planted last year in a bed and it's in a lot of shade, maybe that explains the lighter color. It's a stunning plant in bloom, a bit of a sleeper during the summer. A fabulous container by Anna Kullgren. Halloween fun using a dead topiary painted black. You have to have mums, right? This silly thing on our "half-off" table just keeps blooming and blooming. I kind of feel sorry for it, it needs a home but it's tender. 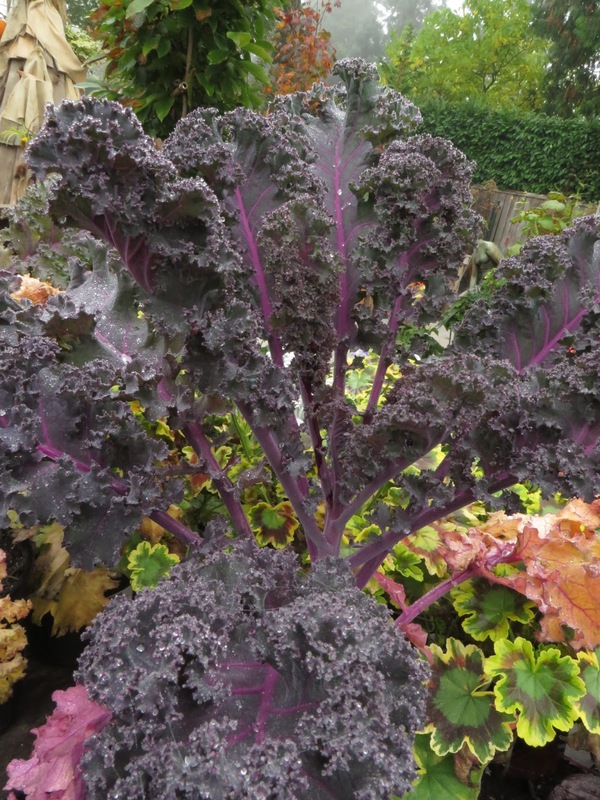 Morning mist collected on the leaves of ornamental kale. Cool fountain and Phormium 'Jester'. Miscanthus 'Cabaret' in the pots in back. Yes, even the cool fountain is on sale. Fall color on a Lagerstroemia (was supposed to be Nachez but the blooms are purple...so, no) or crape myrtle. The ferns are looking refreshing! We have a great variety. Nice color combination of a hydrangea (right) and Leucothoe fontanesiana 'Rainbow'. More fall color from spent hydrangea blooms. A sneak peek of these sweet ornaments. 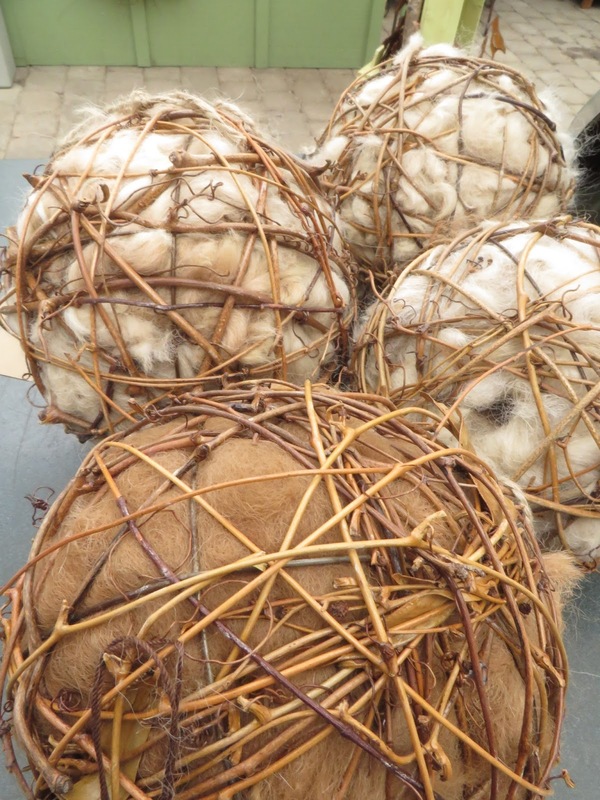 They hail from Elegant Garden Design; we just received our shipment today. They will be available next week and some are even holiday ornaments. So sweet. Chick-a-DEE DEE DEE. Maybe I need this one. These are also from Elegant Garden Design. They are stuffed with alpaca fluff for the birds to use for nest-making. I love these! I will buy one as soon as they are available. A parting shot appropriate for the time of year. I get to work around this every day and for that, I am eternally grateful. To breathe fresh air and work around plants is truly a blessing, and my colleagues Anna, William and Gina are the best people---we really are a great team. I am honored to be a part of it. If you're in the area, stop by and say hello! We'd love to have you. Oh, and did I mention we have a coffee shop now? A little cozy cafe, Antonio's, run by Gabe - a great guy who makes a mean espresso. 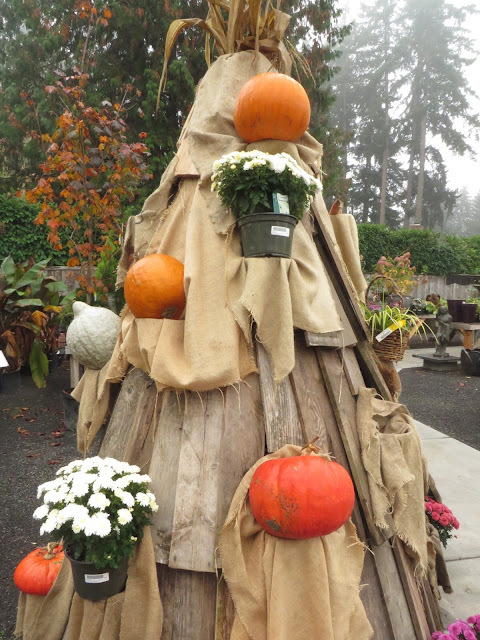 So that is what's happening this week at Chickadee Gardens. As always thank you for reading and until next time, happy gardening! 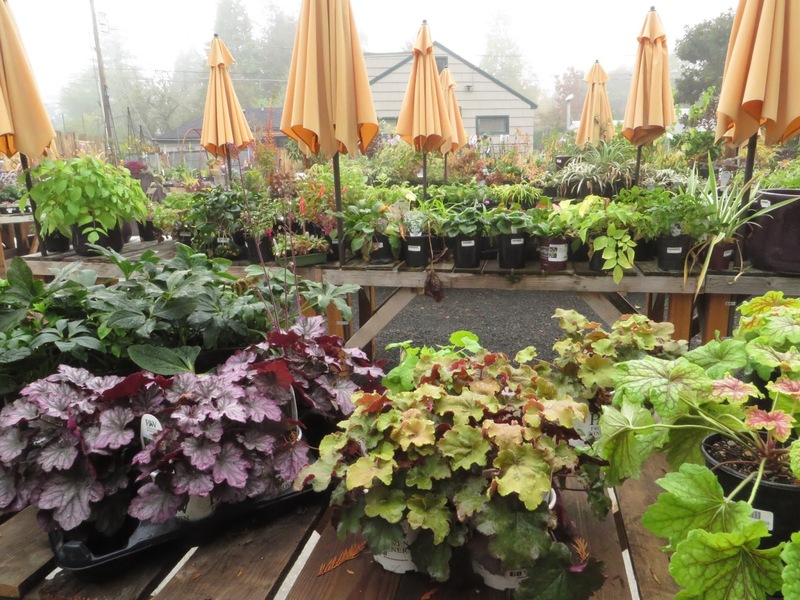 Oh, yes, I challenge any of us garden addicts to work here and not spend at least 1/3 of your paycheck on plants. It's a problem. Oh, you make me feel very tempted! Next time I visit Portland, I really need to find time to poke my head in here. Oh, good! Anna and I want to see your gorgeous face here sometime! That nursery is a great one with all you need for the garden. You are so lucky to work and enjoy there, I can imagine you take more home than you would need, fortunately you are moving soon to a large garden. I am lucky, aren't I? And yes, the larger garden helps everyone's bottom line. Well, at least the nursery's! Lots of nice plants and looks very well presented! Thanks, guys! William is great at visualizing and creating incredible spaces. It looks like a great place to work and a great sale. I'd have no problem whatsoever coming up with 11 items - if only I didn't have to buy a plant ticket and rent a car to get there! It is a great place! 11 items? For me it's more like 77. No problem! Where is beam-technology when we need it? You evil temptress! Your gorgeous pictures make me want to hop in the car and visit, especially that one with all of the great rusty metal and cool fountain! 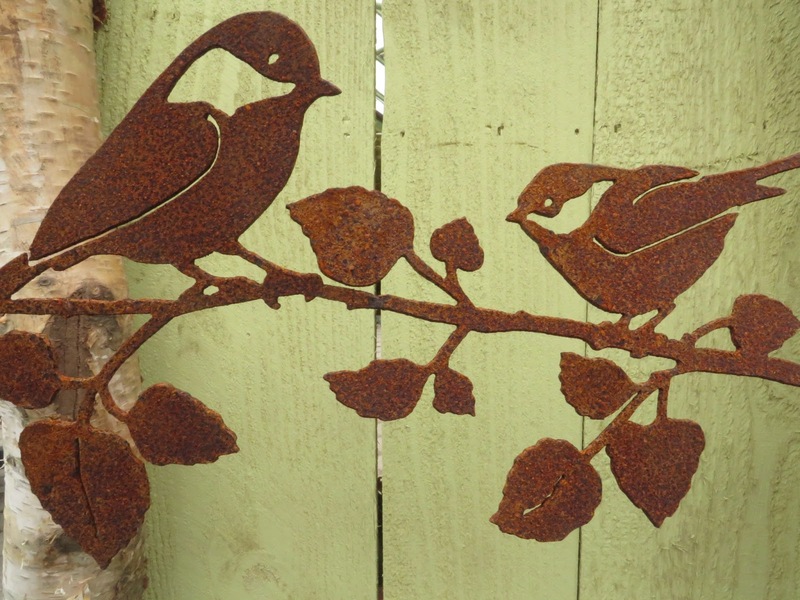 You definitely need that cute chickadee and certainly the wonderful arch for your new garden! Oh...Evil Temptress is my new name, I like it! I hope you DO hop in the car, grab Alison and come pay me and Anna a visit soon. I will get that chickadee....the arch? A bit out of my budget. I was so tempted to visit before heading north for the weekend, but my care was already stuffed with plants. I do wish it had been otherwise. 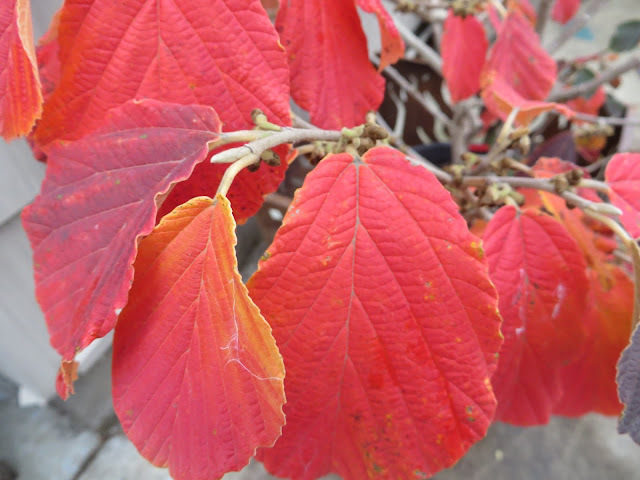 Hamamelis are on my "must add" list this fall. Now I know which Sorbaria I must have gotten from Anna, but did you mean 'Sem'? Or is 'Gem' a new cultivar? I love the metal owl! And the chickadees! I'm not big on garden art, but those are great! Oh, well we understand :) But DO come by one of these days - we'd love to have you, Evan! 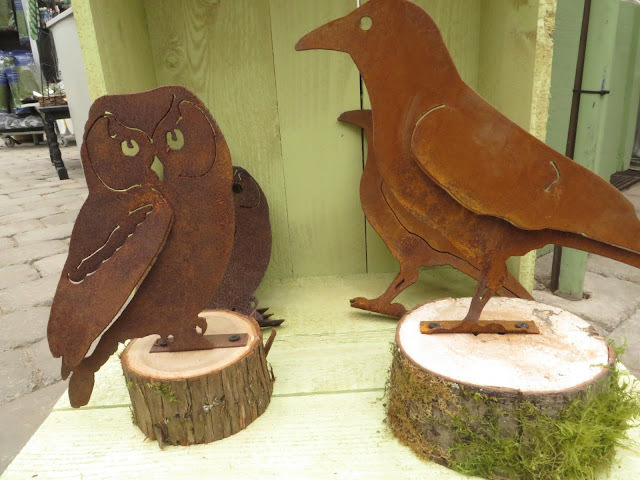 Yes, those metal birds are super cool...rustic enough to blend in and be a subtle addition to the garden. Even the little ornaments (not pictured) would be great for a Christmas tree. You're trying to get me to come buy that Passiflora aren't you?